Results of degree first year of Lalit Narayan Mithila University were declared in the month of June 2017. It was expected that the next LNMU Part 2 Examination will be organized in the September or October as you know there was a big delay in the first year exam too. This post is all about the degree second year exam of lnmu darbh naga, and in this post, you will get the most latest updates related to part 2 exam. Examination date, Registration link and Routine are already updated! Year by year, University is shifting their offline activities like Admission, Registration, and merit list activities to online. Till then it was limited to Intermediate and Degree 1st Part but this year, LNMU Online application of Degree Part 2 will be filled online on the official web portal of the university. The online application will be started from 01 August 2017 and the probable date of starting exam is also scheduled from 29th August 2017 (According to Local Hindustan Newspaper). Offical notification of LNMU Part 2 Apply 2017 is released from the university. According to the notification released by the university, the last date of filling application form is 12 August and 2017 and after that additional Rs. 30 will be charged as the late fine till 17 August 2017. The probable date of Examination is also mentioned from 29 August 2017. For a quick reference, we are publishing the important dates and it will be updating in the future if there will be any changes in the current schedule. Let us know if you are having any issues while filling the online form. Comment your problems below and we will get back to you soon. Update - 18th August, 2017 Even after the last date of online apply, Online Registration is still live. May be the time is extended from the University. Till now, University has not released any notification regarding the extended date on their official website. May be it will be live for next 2 days. More information regarding this will be published as soon as possible. Update - 20th August, 2017 - 4:00 PM Last date of filling online registration form was 17th august but it was live even after the 17th. Now, Part 2 Examination Registration is Closed. 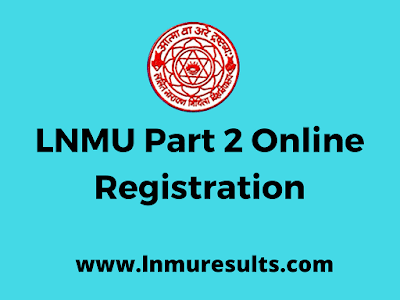 LNMU has finally updated their online web portal with the notification that Online Application for Part 2 is now closed and Online Registration for Part 1 Examination is Live. Update - 24 August, 2017 - Big Update guys! Examination Dates have been changed for the second year examination of lnmu darbhanga. Examination will now start on 11th September, 2017. In a notification released from University, It is mentioned that Both, LNMU Part 1 and Part 2 Examination dates are extended to 20th September and 11th Respectively. Although, The updated and new routine is not released yet and we will update it as soon as it is releaesd by University. Update (01 September 2017) - So, online applications are now closed for part 2 students. However, they can download their submitted application from the given link on their official web portal. Facing any type of issues? - I can see that a lot of applicants are facing issues in filling their online application form. In case of any problem, whether it is for payment failure, about filling wrong details or anything, contact University directly via the above-mentioned Helpline number and do whatever they guide. As it was mentioned in the notification that the probable date of examination date will be 29 August. University has released the examination program of degree second year. The local newspaper, Prabhat khabar has mentioned that the examination schedule is released by the university on Saturday, 12th August. Till now, there's no update on the official web portal. We will update it as soon as it will be published. The examination will start from 29th August 2017 and will continue till 12th October 2017. Check out the below section to download the detailed routine. Update - 12 Nov 2017 - - University has released the date of Practicle exams for LNMU Part 2. In the below table I am updating those details. College wise list is not released, You will have to contact your college for exact date of practicals. Update - 18 Nov 2017 - University has released the detailed practical details with center details and subjects of Hons. which is starting from 20th November. Download it from the below table now. In this downloadable document, all the information you need related to exam is included like centre list, Group details, exam dates and all. Big update guys. Part 2 admit card is now available to download on the official web portal of lnmu darbhanga. Click on the below button and on the next page, Click on Get Part 2 Admit Card and enter your registration number. Click on search and you will get your admit card. Note :- In case your photo and signatures are missing on the admit card, there's an option to upload it. So, no need to worry about that too. Please note that website of downloading Admit Card is going down again and again. If you are getting any type of errors, Kindly check back again after sometime. For all the latest updates related to Lalit narayan mithila university darbhanga, keep visiting LNMUResults.com. Also, don't forget to share this post with your friends. If you have any questions and doubts related to LNMU Part 2 Online Registration then don't forget to drop a comment below and we will revert back soon. Thanks a lot for dropping your comment here. In the notification released from LNMU, It is said that online application will be live from 01 august but till now, it's not available to apply. Please wait and I will update this post with all the required details and links. Will start very soon. Please wait ! Firstly, I would like to thank you for taking time for a comment on this post. Website is working fine now. can you provide me link of part2 registration form? Please check the table in which I have updated the link to apply for part 2 ! sir, i have mistakely not ticked (optinal all subject) and filled my form wrongly,and also i am not able to correct my registration form,now only showing for payment,so plz help me how can i correct my registration form ,can you provide edit option for my subject,i wana edit my subject and still i have not made my payment.so plz help me. I understand your issue. If you have not made your payment till now, there must be a option of 'edit' near the 'payment' option. Click on it and edit the details. Make sure your balance was deducted from your account and transaction was completely successfully. If everything is alright from your side then kindly contact University through the helpline number mentioned on the Apply Online portal. Please contact University with your details on the above mentioned helpline number. I entered incorrect university roll number and made payment. Now how this can be corrected or what options are available to me? I would like to suggest you to contact University in this case. Although, if you are a regular applicant then there shouldn't be any option of filling Roll no. Still, if you have filled the wrong details, please contact the LNMU Darbhanga on the above mentioned Helpline number.